Fakro LST Scissor Attic Ladder is made from powder-coated quality steel and hand selected pine. Fully assembled unit is nicely finished with attention to detail and is ready to install. Well balanced scissor system ensures safe and easy operation and delivers 350 lbs. load capacity. The ladder unfolds and folds with minimum force and no sudden movements. Standard ladder length can be adjusted by adding or removing step segments, where each step is adding 8-inch to a ceiling height (step model # LSS 31, max. two steps). Offering a unique, modern appearance in a simple design, the S-shaped steps also conveniently serve as handrails while climbing. The FAKRO LXT Additional Tread gives you an extra step up before entering the attic. The LXT tread installs between the attic ladders last tread and the floor of the attic. It makes stepping into the attic easier and safer, especially when there is a large space between the last step of the attic ladder and the attic floor. The standard width of the LXT additional tread is 12 inches. For use with FAKRO three-section folding attic ladders in rough opening 22 1/2x54, 25x54, and 30x54. The metal insulated LMP attic ladder accommodates a floor to ceiling height of up to 12 feet. The ladder unfolds in three sections with the help of a piston handrail which prevents sudden movements and ensures smooth operation. The sandwich-insulated lid and perimeter gasket seals the attic ladder and provides an effective barrier between the attic and space below. Includes a handrail and ladder end caps. Includes an opening rod. The FAKRO piston-assisted Upper Hatch is sealed to improve the overall insulation and seal of your FAKRO attic ladder. The upper hatch acts as a cover, safely closing off the opening in the attic floor. The height of the upper hatch box is 7 3/4 inches (20cm). Compatible with all FAKRO attic ladders, including LWN, LWP, LWT, LWF, OWM, LMS, and LST. For the LST model, the FAKRO Frame Extension Kit (LXN-B) is available for purchase and should be installed before the Upper Hatch. This Louisville Big Boy Series wood attic ladder has a working load capability of 350lbs. 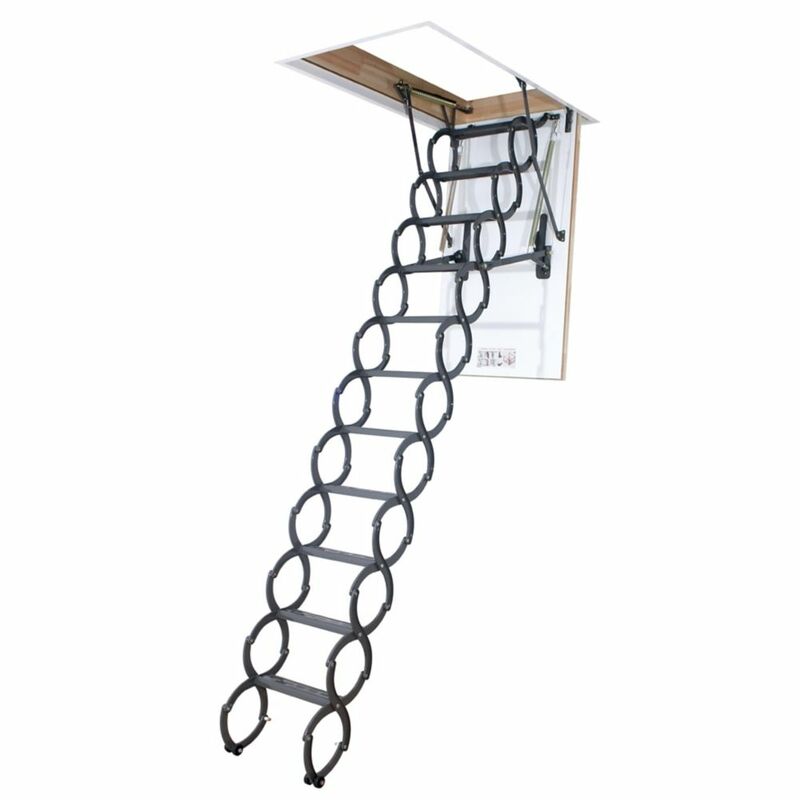 This wood attic ladder fits ceiling heights of 8' 9" to 10' and has a rough opening of 30" X 60". The Big Boy L305P features extra-deep 5-1/4" reinforced steps, adjustable spring, an ergonomic T-handle, and easy-hang straps. LST 9 ft. 6-inch, 25-inch x 54-inch Insulated Steel Scissor Attic Ladder with 300 lb. Capacity Fakro LST Scissor Attic Ladder is made from powder-coated quality steel and hand selected pine. Fully assembled unit is nicely finished with attention to detail and is ready to install. Well balanced scissor system ensures safe and easy operation and delivers 350 lbs. load capacity. The ladder unfolds and folds with minimum force and no sudden movements. Standard ladder length can be adjusted by adding or removing step segments, where each step is adding 8-inch to a ceiling height (step model # LSS 31, max. two steps). Offering a unique, modern appearance in a simple design, the S-shaped steps also conveniently serve as handrails while climbing. LST 9 ft. 6-inch, 25-inch x 54-inch Insulated Steel Scissor Attic Ladder with 300 lb. Capacity is rated 4.2 out of 5 by 9. Rated 4 out of 5 by handytom from Well make unit. Fairly simple to install. Biggest challenge is that it is heavy, requiring at l... Well make unit. Fairly simple to install. Biggest challenge is that it is heavy, requiring at least two people to install. I set up an electric winch in the attic to lift it into place, which helped a lot. Once it is in place, they have a slick support method that hooks over the attic floor that both holds it in place and allows for easy adjustment of the height. Steps are fairly narrow - like a normal ladder, so if you are carrying bulky items, it is a little more challenging than compared to many of the wooden attic ladders on the market. Rated 5 out of 5 by Anonymous from Solid ladder I have used the ladder for about a month now, and it has been great. Many people think it is cool, but I purchased it because it solved an issue of new tri-fold ladders not clearing the transom window above a doorway. You need at minimum three able-bodied individuals to lift this in place. Four if you can. The two (or three) people below will each need an A-frame ladder to climb while hoisting the attic ladder over their heads. One person needs to be in attic to secure it. Rated 5 out of 5 by HappyinArcataCA from Fantastic quality easy to install! I can't recommend this stair enough. It was easy to install but I would suggest three people. One in the attic to secure it in place and two people to lift iit in place. Otherwise it was extremely easy to install and needed no adjustments right out of the box. Home Depot shipped it free and it arrived within a reasonable amount of time and in perfect condition. The non written instructions were easy to follow and the quality of the stair and ease of use is fantastic! I highly recommend this stair! Rated 5 out of 5 by Presiceo from Really great ladder The ladder did have some minor damage when I recd it, but we were able to fix it easily. My only complaint is that I wish the stair steps were a little wider. Other than that I really like this ladder. Rated 4 out of 5 by diy101 from Perfect for quick ease of access I was looking for an attic ladder to replace the wooden one that I already had. The existing wooden ladder was hard to pull down, hard to unfold, not very stable (it flexed too much) to go up and down on and did not have a good seal / weather stripping and insulation on the access door. I looked for a long time for an access ladder to solve all of the above issues, I found two, one from Fakro and one from Rainbow. To be honest, I wanted the Rainbow as it had a wider ladder and deeper steps, however, it would not work in my particular installation as I would not be able to open the ladder due to the arch it took (projection) when opening as I have a door frame in the way that it would hit, hence I would not be able to open it. So I ordered the Fakro as it did not require that large an arch when opening as it opens more straight down verses taking that large arch. The ladder installation was straight forward, but you do need two or three people to get it in as it is HEAVY and one of these people needs to be up in the attic and the other two below lifting it into position. Once put in place and secured, it worked perfectly, and was very simple to adjust. - The access door opens and closes easily, the springs are perfectly balanced. - It is a very thick door, and very well insulated and the weather stripping stops all drafts. I could tell the difference in the room instantly as it was installed on a very cold day. - Once the access door is opened, it is a simple pull down on the stairs and to push back up when ready to close the access door. - As I said, it is not a very wide ladder, the steps are just under 12 inches wide, where the wooden ladder (and the Rainbow) stairs were 14 inches. This is pretty easy to get used to especially since the ladder is STABLE, no flexing as the wooden ladder did. The steps I think are 3.5 inches deep. - The ladder is made of sold metal (not sure what type) and the supports to the steps also server as the hand rail for going up and down, and nice touch as the wooden ladder did not have this. I gave this product 4 stars for two reasons, 1) I would prefer it to have wider steps, like 14 inches, not sure why they did not do this. 2) They supply the product with an easy to install and level kit that comes with long threaded rods which in my case were too short, but probably is okay for most installations. As each issue above was/is not that big a deal, I highly recommend this ladder access ladder. It is a solid product, a little pricey, but you get what you pay for. Rated 3 out of 5 by nick from to expensive never buy again not good to expensive never buy again this product. Rated 4 out of 5 by petep2112 from Hard to find review I've not seen a comprehensive review of this so I decided to do one for the benefit of those who are considering buying this attic ladder, while at the same time staying within the confines of Home Depot’s review rules. My Situation I needed to replace the original attic ladder in my 15 year-old house. It was a wooded fold-down type that kept getting ricketier with every use. It was no doubt the cheapest the builder could obtain at the time the house was built. The opening in my garage ceiling is 25x54—this limited my options for a replacement. I also wanted to put something in that I hoped I would never have to replace again. I have a semi-finished attic and the ladder gets a lot of use. I also wanted something that exceeded the typical 250 pound rating of most attic ladders. This meant I probably needed to stay away from a wooden ladder and go with a steel or aluminum ladder. Another limiting factor was that the floor to ceiling height in my garage was close to 11 feet. Again, this limited my options. After doing quite a bit of online research, if found this Fakro LST 25 x 54 available at Home Depot. With 2 additional LSS 31 steps this seemed to be a perfect ladder for my needs. Shipping Firstly, the items did not qualify for free shipping. I was expecting this, even though many ceiling ladders on the Home Depot web site did qualify for free shipping. What I did not expect was the 15 days it took to travel from its point of origin to my house. Put it this way—I could have driven to the point of origin, picked this thing up (if they allowed it) and driven back to my house in one day. I paid a three-figure sum to have this delivered to my house and two weeks to wait on this thing was just too long. Unpacking The first thing that I noticed when I began to remove the shrink-wrap from the pallet this was shipped on was that there were things rattling around inside it. Closer inspection revealed several loose items inside and I began to have more doubts as to whether this was worth the cost (nearly 8 Benjamins delivered). Some of the loose items turned out to be a couple broken washers that, along with their associated bolts and nylon lock-nuts, hold the scissor-type ladder together. Of more concern was a missing “peg” that holds the scissor ladder in its locked position when folded up and stowed. That seemed like a critical part. Fortunately the pieces were found—caught in-between the ladder frame and exterior packaging. This was then re-installed with no issue. Instructions I was able to get a couple of .pdf documents from the manufacturer’s web site before I bought this. They consisted of 2 standard letter sized illustrations of how to install the extra steps and the ladder itself. Knowing that Fakro is a Polish company and distribute their products all around the world, I halfway expected this. Illustrations versus written instructions are probably preferred—especially when considering that translating detailed instructions in many different languages can be problematic. The same two pages were included in the package as well as a 10+ page very well-written and illustrated guide on how to create your ceiling opening should you require it. LSS 31 Scissor Ladder Step Your installation may not require this, but mine did. I needed 2 in order to meet the height requirement of my ceiling opening. Installation was quite easy. Because of the recessed nuts and bolts inside the scissor frame, I used 2 ratchets with sockets. It just made it faster. Note that all fasteners are metric. This is also where the broken washers come into play. You have to remove the bottom section of the scissor assembly and insert the step(s) where the bottom section was removed. Both of the broken washers were on this bottom section. I checked all the other fastening points to see if any other washers may have suffered the same fate, but the rest were intact. In fact, there were some that had double washers. I removed the extras and had enough to install where the others had broken. The washer are quite thin and have a concave/convex shape that, when used with the nylon lock nut, allows for a secure assembly while still letting the scissor action perform as intended. Inserting the step assemblies took about 5 minutes each. Assembly Again, the illustrations versus written instructions were not a limiting factor assembling this ceiling ladder. The drawings were very representative of what the product actually looks like. The corner sections and trim pieces need to be installed first. One of the short (25 inch) trim pieces was missing a hole for the screw to fasten it to the exterior frame. Interestingly it was on the opposite side of this L-shaped piece. Guess it wasn’t caught by Quality Control after it was manufactured. No problem. Five minutes later, with the help of my drill press, I was back in action. However, the misaligned hole is now visible after installation. Next came the installation of the corner brackets. These used all-thread bolts matched to a corresponding corner brackets on the frame. It was here that I realized that the depth of this frame was an inch or two deeper than the opening it was going into. The length and width were perfect. Now, my attic is probably like many others here in the south and is constructed with 2x6s. With the 5/8 drywall below and 5/8 plywood floor above, this meant that the frame would protrude above the floor level of my attic—and that the brackets used to secure the frame in place would not work. The frame on my old ladder was about 4 inches deep while this one exceeded 8. I didn’t quite like the idea of this and nowhere on any website did I find this actual dimension. The full depth of the ladder assembly to the bottom of the frame is listed (15.75 inches), but not the depth of the frame. At this point I was pretty much committed and decided to go ahead with the installation, knowing that I would have to step over this intrusion every time I used the ladder to access my attic. Installation This thing weighs around 90 pounds. I would recommend using scaffolding to install it. Even with that, it took me and two other guys to get it up into place—two down below and one up in the attic. Be careful where you grab during installation because you can cause this thing to perform its intended purpose while fitting it into place (opening up and deploying its ladder). For this reason I temporarily secured the ladder assembly to the frame. The fit was near perfect and very few shims were necessary. I secured the frame with high-quality deck screws since the corner tightening brackets would not work. I did use them, at least temporarily, with some 8-inch 2x4s to securely lift the frame the final few fractions of an inch to get the trim right up against the ceiling. They were later removed at the end of the installation. An eyebolt is screwed into a pre-drilled hole to finish installation. An included 2-section pole is use in this eyebolt to both lower the door and deploy the scissor ladder. Operation and Adjustment It was during the first deployment of the scissor ladder that I found out another problem with the shipping and handling of this attic ladder. The opening appeared to fold out properly, but there was some misalignment of the outside brackets—the same brackets that are installed on nearly every other type of attic ladder. They are used to hold the large bottom door that the ladder is secured to. Both brackets were slightly bent meaning they didn’t lock into place when the door was lowered to its vertical position. They are about 16 inches long and because they are light steel, are easily bent and distorted, preventing them from locking securely. This is not really something you’ll find out until you get it installed. After conferring about this with my helpers (one of them a mechanical engineer), we applied a little pressure on the offending brackets and aligned them properly. I’m sure both the manufacturer and the shipper would blame me for the damage, but we took great care when we handled this assembly—especially when installing it in the ceiling. I still suspect it occurred during shipping. The last step was to adjust the angle of the staircase. Again, the detailed illustrations are well suited for this procedure, showing you what to adjust to align the steps to the floor. After 3 or 4 times of opening and closing the door and deploying the ladder, we had it adjusted properly. Pros 1. Well engineered 2. Sturdy 3. Very good illustrations for installing 4. Easily adjusted or expanded for different ceiling heights 5. Modern design well suited for smooth ceilings 6. Has some insulation value and a door gasket 7. 440 pound rating Cons 1. Expensive 2. Narrow steps (12 inches) 3. Heavy 4. Depth may exceed your ceiling opening 5. Slow shipping Final Thoughts I know this a rather lengthy review, but honestly, I couldn’t find anything close to this one I just wrote to help me with my decision. I am by no means a contractor, but I do a lot of home improvement projects that other people would probably get a professional to do. Even with limited information on this product I don’t regret buying it online or installing it.